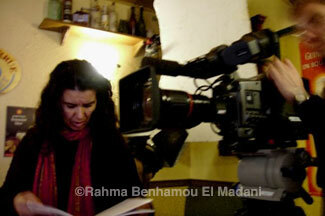 Interview with Rahma Benhamou El Madani and translation from French to English by Beti Ellerson. Through her films, Rahma Benhamou El Madani discovers and examines her multiple identities. Her latest film Tagnawittude also allows her to rediscover gnawa music and its mystical practices. Rahma, your identity is of multiple origins: Algeria, Morocco and France. Tell us about your background and how it has formed and influenced you. I was born in Algeria, in a small village near Oran. My father and mother are Moroccan, they settled in this village, which is where Marcel Cerdan* was born in fact, where many colonial farmers lived from the produce of the vineyard. My parents left Morocco and the Atlas to cross the border to Algeria, my father often went there as a seasonal worker. All their children were born in this village. Then at independence, there was the conflict between Western Sahara regarding the borders between Algeria and Morocco, as has been the case in other African countries. The conflict became more and more serious. In 1968 my father left Algeria and went to France. In 1972, worried about the turn of events, my parents decided to leave Algeria definitively and we settled in France, where my father again worked in the vineyards. So, cut off from my Moroccan roots, I discovered Morocco and the Atlas at ten years old during the summer holidays. My Algerian roots have been painfully severed. I try to reconnect with these roots through my films. It took me a long time to find this equilibrium because the elders do not realise that their paths shape us and that they must leave traces for us, so that these memories are not lost. This is what I try to find again, the memory of our world intertwined with each other. The history of Morocco, of Algeria and also of France as it relates to these two countries. Your training and interests are just as diverse! Language sciences, radio broadcasting and then cinema, do they have points of convergence? How did you come to cinema by this trajectory? As far back as I can remember storytelling was important to me. I did a stint in language sciences with the idea of studying journalism... and an internship with AFP (Agence France Presse) thanks to a chief editor, also from Algeria, who took me under his wing, and convinced me to take my time with my subjects... So I chose to learn by working in the field rather than through school. I definitely chose the more difficult path... I did not know yet that I was heading toward cinema, it seemed particularly difficult to access for several reasons. I continued my studies while trying my hand at radio broadcasting—with political debates, music programs and radio interviews... my experience ended when I started to conduct a variety of radio documentaries. Writing was already very present in my life. And at the time cameras were heavy, so that when I was looking for information about courses related to the image at Fine Arts schools, or the AFPA (National Association for Adult Vocational Training), I realised that the curriculum was reserved for men. At the time, I did photography in the absence of the moving picture. Hence, cinema came into my life through photography. Then life had it that with my companion, I left Bordeaux for Lille. I decided to drop radio and the image and tried teaching--in the direction of French as a foreign language. And paradoxically at that moment I met a teacher of film studies, who was also an activist in MRAP (Movement against Racism and for Friendship among Peoples) and an organizer of a film festival in Lille (the Acharnière), and I returned to my original path. After her classes she gave me some quick tips that I wrote down rapidly, though I never enrolled in the courses. Once again this fear in my heart of not wanting to leave the field of action. It was during my pregnancy that I became aware of my desire to make a documentary. I wrote a lot. Sectors of the French housing projects were at a boiling point, France began to realize that the young people from immigrant families who lived there were exploding with anger. Khaled Khelkal* became a terrorist and France had to open its eyes to this world. Having come from radio, I had obviously a terrible time convincing myself to make the transition, but I did. I quickly understood thanks to the film studies teacher that I should not be afraid of film production. In order to speak to producers one must understand what it is about. Your films follow your own journey. Between the Maghreb and France in search for your past and present history, that of your parents, and also of the lives of the people who live around you. Why these themes? Why use this approach to explore them? Tells us a bit about your films. As my first film was not successful, I decided to take a pause because the topic was too sensitive for me to be influenced by a producer. I chose not to do it the way I was asked to. However a fifteen-minute film essay called "The Emotion of an Encounter" remains. It takes place in Vaulx en Velin in 1995 when the media was focusing on the terrorism that took place there during that time. My father retired and decided to go live in Morocco. I sensed an urgency to have my parents talk about the conflict between Algeria and Morocco, then taboo. DVCAM cameras were finally emerging. I learned how to use it and attended a filmmaking workshop. I filmed my parents, doing both the image and sound myself. I wanted to find my agility again. The film was co-produced by the Dardenne brothers. Jean Pierre Dardenne taught me something I still remember: never forget the instinctive desire to tell a story. With these words as my guiding force, I did extremely well at the screenings and discussions that were often very passionate. It became very difficult to attend the film screenings, and finally I decided to stop the Q&A sessions that followed, which were often indicative of the ongoing conflict between my two Maghreb countries. Tagnawittude! What a great title for the film! What is gnawa music? I was often in contact with musicians during my time in radio broadcasting. One cameraman showed me some images during the African tour of the group Gnawa Diffusion. I knew the singer Amazigh Kateb because of my interest in the work Nedjma by his father Kateb Yacine, which allowed me to maintain my invisible link with my homeland. This encounter was very significant for me, allowing me to return to Algeria to shoot Tagnawittude. I was not yet ready to talk about Algeria. So I decided instead to combine my two countries by telling their common history, their common culture, through gnawa music. As this ancestral culture was currently in fashion, I seized the opportunity to connect with the musicians of the group Gnawa Diffusion, as well as Amazigh and Aziz Maysour. Moreover, it comes together rather well with the sonorous effects in the western world. The film production was rather challenging, and the process chaotic. There was very little funding and a lot of down time between shootings because of the power of the film footage and my investment in the project. The film was very difficult to make. I had to pause quite often in order to understand the culture, to seek explanations while on location, and to persevere in situations where many would have stopped—because all my friends advised me to move on to another subject. At the present, gnawa music is very trendy in the Maghreb, which may be explained by the search for the essence of our culture among the youth. But also in different sectors of the Maghreb society caught between the west and the religious world. In fact, gnawa music speaks to everyone. What inspired you to make a film about gnawa music? What was your approach? Your journey and discoveries? What inspired me at the outset let’s say, is this vision that I had when seeing the Moroccan maestro Maalem Hmida Boussou descending the stairs, which made me think of my maternal grandfather. In fact, Amazigh Kateb asked me, "how is it that your grandfather is black?..." Again this response triggered something inside of me. And listening to the Algerian maestro Maalem Ben Issa talk to me quietly about this culture while playing the guembri, it was so blues, so intense... I could not help but feel something that must have created a kind of reminiscence. My origins rising to the surface. I put a lot of time into viewing my images, logging step by step each time I returned from my film shoots. For me it was important to film my research because I knew that to follow a singer like Amazigh Kateb would be vigorous. I never thought that there would be only men in the film. Yet I faced this problem without ever thinking about it. Filming the musicians during the tour in France was very challenging because I was there by myself, I set up the camera and I filmed without talking to anyone. I knew I was in a minefield anyway so I asserted myself through my silence. However, after some very tricky situations I decided to work with a camera operator, and to do the sound, keeping a second camera that I used when I felt the need. It was rather odd to find myself in the position of boom operator in the middle of gnawa, but no one ever disrespected me or criticised my presence. 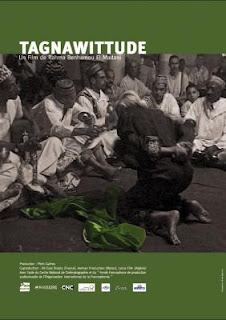 This film helped me understand the practice of the trance in the Maghreb and also to discover this culture through its music. After the Essaouira Festival I had the opportunity to travel by plane from Casablanca to Algiers. I wanted to live this symbolic link, which still today remains a very important trip for me. This film is also personal, as a little girl you encountered the gnawa spirit through your mother as she practiced the trance. How have these childhood memories evolved? How have they influenced you? I did not understand right away the trance of my mother. It took me years to grasp it. My mother continued to practice it privately in France. And as I got closer to the gnawa music I began to understand what she was experiencing. I showed her the footage that I shot during my research. She named the objects surrounding the gnawa practice, and without further explanation, I understood. My mother was initiated in Algeria and I think that I was able to evoke this memory when listening to these musicians play while on location and even before, when listening to the group Gnawa Diffusion. These practices of the trance have clearly marked my worldview. I have been marked by the visits to the marabouts and other mystical practices. The invisible is important in the world of the women of the Maghreb. Obviously I have been inspired a lot by the trance practiced by my mother and I think that her beliefs and vision of the invisible world have given me the impetus to write and create. What has been the reception of Tagnawittude? I was very touched by the Algiers premiere. It was a success both in terms of the public and the press. I actually spent ten days responding to journalists, it was a very important reception for me to be able to say who I am, what I was doing there and why. Algeria, thirty-four years later, was very welcoming. Morocco was a bit more problematic. The premiere of the film was canceled due to the floods the day of the scheduled screening in Casablanca, which was plunged into chaos. I planned this important trip, two months before the Jasmine revolution. First to Carthage then to Algiers, next to Oran, my hometown and last to Casablanca. I had a desire to see the Maghreb, and for one and a half months while screening my film I made this journey. The Maghreb, with open borders in the past, now divides and separates these people with the same origins. Tagnawittude has traveled from Dubai to Montreal, to Santiago, Chile, to Tennessee, Arizona, and New York. Back to Algiers for the Ramadan vigils... to Paris, and soon to Geneva… The film seems to be enjoyed by a diverse public. The discussions in Dubai and New York revolved around the religious aspect of this culture. Of course, there is this hint of tolerance in the gnawa, which is first and foremost a Sufi religious brotherhood. As for France the film will be released on 6 June first at the Cinéma la Clef in Paris, and then we will accompany the film screenings to mini-concerts in other venues. We are working on the release of the DVD and are still hoping for post-production assistance for theatrical release, and especially for assistance from the CNC (National Center of Cinematography and the moving image). Time will tell if this film will be well received in France. As for Morocco, I hope it will eventually be shown there, of course I wish it will take place under better conditions. *Marcel Cerdan, a French pied noir born in what was then French Algeria, was a world boxing champion. *Kahled Khelkal who was born in Algeria and immigrated to France as a child, was affiliated with the GIA (Groupe Islamique Armé) and involved in terrorist activities in France in 1995. *The Pasqua-Debré laws are three French laws adopted in 1986, 1993 and 1997 whose objective was to regulate immigration.